Line baking sheet with parchment paper, aluminum foil or silicone baking sheet. Microwave white chocolate chips and oil in glass measuring cup (for easy dipping) in 30 second intervals, stirring often, just until fully melted. Dip stick into warm chocolate and press into one end of marshmallow. Continue with all 16 marshmallows. 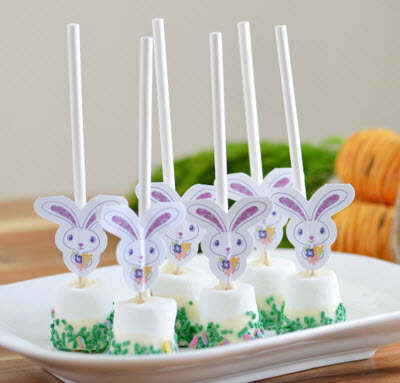 Using stick, dip marshmallows halfway into chocolate. Gentle shake off excess chocolate. Sprinkle chocolate with sprinkles and set on baking sheet to dry. Store in airtight container until serving or wrap with candy bags.